The VXI7000 Series instruments contain a Noise Com amplified noise source that is tuned to provide the best flatness at the instrument output. The amplifier is optimized to deliver an unsaturated output with a Gaussian amplitude distribution. Noise output power level can be adjusted from 0 to 127 dB in 1 dB (and optionally 0.1 dB) steps. The output state is controlled by an RF switch. In the standby state, the noise is terminated into an RF load and in the on state it is directed to the output connector. The flexible architecture of the instrument allows many options to be specified: Switched filter bank: Allows up to four filters in the noise path. The filters can be specified in any combination of bandpass, lowpass, highpass, or notch. A thru line and set of terminations (RF loads) are also included. Output combiner: Allows the user to inject a signal and add a controlled amount of noise. 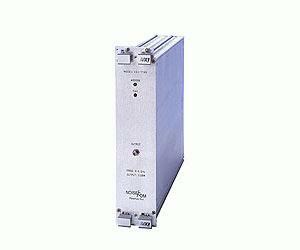 Signal attenuator: Available in 0.1 or 1 dB steps to 127 dB.